Tory Historian is always happy to learn something new. For instance, casual survey of the internet informs one that today is the anniversary of the last French invasion of Britain. Well, no, it is not the anniversary of the last successful invasion - that remains the Norman one of 1066 (though whether the Normans were actually French is debatable). This is a wonderful story of French ships arriving at Fishguard, being scared off by the canons and landing troops and ammunition nearby. On Wednesday, February 22, the French warships sailed into Fishguard Bay, to be greeted by canon fire from the local fort. Unbeknown to the French the cannon was being fired as an alarm to the local townsfolk, nervously the ships withdrew and sailed on until they reached a small sandy beach near the village of Llanwnda. Men, arms and gunpowder were unloaded and by 2 am on the morning of Thursday, February 23rd, the last invasion of Britain was completed. The ships returned to France with a special despatch being sent to the Directory in Paris informing them of the successful landing. One wonders what happened to the special dispatch. The whole thing sounds like something out of "Carry On - Don't Lose Your Head". It would appear that after some looting and a heavy meal with a great deal of drinking the French troops were easily rounded up by the local militia led by Lord Cawdor, who were helped by the women of Fishguard in their traditional Welsh costume. One lady, Jemima Nicholas otherwise known as Jemima Fawr (Jemima the Great) captured 12 of them, using only a pitchfork. Incidentally, does anybody know whether this story is true? "The past is another country"
L. P. Hartley, not one of Tory Historian’s favourite writers, started his best-known book (mostly because of the film with Julie Christie and Alan Bates) with the words: “The past is another country; they do things differently there”. 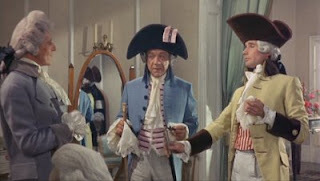 As it happens, Tory Historian disagrees with that and feels that, maybe, novelists should not make comments about history (unless we are talking about Georgette Heyer). In essence, whatever the details may be, people do not do things differently in the past from the present. While there is nothing attractive in rose-coloured glasses or, to be precise, in people looking at the past through rose-coloured glasses, the sneering proclamation of the superiority of everything in the present is no better. These random thoughts appeared during the reading of Anita Desai’s introduction to the Virago edition of Lady Mary Wortley Montagu’s “Turkish Embassy Letters”. Lady Mary, one of the most attractive letter writers of a period that boasted many such individuals, is patted on the head for “her ability to study and alien culture according to its own values” and for “a rare ability to see herself through the eyes of others”. If only Ms Desai shared these abilities. She is so horrified by the fact that Lady Mary’s father conducted financial negotiations with her suitor, Edward Wortley Montagu, that she quite forgets to explain why those negotiations came to nothing. Or to tell us how and when were the young people reconciled with the Earl of Kingston, later Marquess of Dorchester. Altogether Ms Desai is horrified by many things and seems unable to study what she sees as an alien culture, England of the eighteenth century, according to its own values. All those people, my dear, Alexander Pope, Horace Walpole, Lord Hervey and Lady Mary herself, are so nasty. Oh my smelling salts! Or a lavender-sprinkled handkerchief! That talent to enjoy was poisoned and distorted by the society in which she moved, what Dervla Murphy calls not the Age of Reason but the Age of Savagery. The attacks made on her by Pope would have dragged him into a court of law for libel nowadays, and Horace Walpole’s insinuation that she suffered from venereal disease (‘the half she yet retains of nose’) would have got him a ruinous fine. In the eighteenth century these jibes were permissible, and Lady Mary’s record as an adversary in the field is not negligible. Her caricature of the hunchbacked Pope could only be acceptable amongst hardened cynics. On the whole, Tory Historian prefers Lady Mary’s robust attitude and responses to Ms Desai’s vapours, particularly as she shows no knowledge or understanding of the period or of the writers involved. Her reference to Dervla Murphy, another non-expert in the subject and another lady given to faintness when writing of the nastiness of the past, is to another edition of the Letters, published by Century in 1988. In it, apart from being horrified by the nastiness of all those brutish people, Ms Murphy apparently speculated whether Lady Mary would have been better off born in the twentieth century and being a career woman. One wonders the reasoning that makes publishers pick such people to introduce eighteenth century letters. Let’s see. 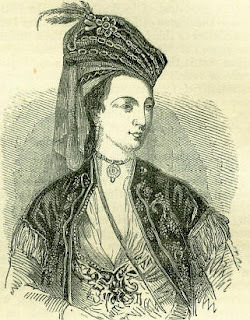 Lady Mary Wortley Montagu was an English woman writer who travelled eastwards to Constantinople and lived there for a year or so. Anita Desai is an English woman writer who was born in the mysterious Orient of half-Hindu, half-German parentage and Dervla Murphy is an Irish woman traveller and bicyclist who has written books about her adventures. So the last two should be able to write about the first one. Well, never mind, the letters themselves are very well worth reading. Tory Historian was delighted to hear that there are moves afoot to erect a permanent memorial in Edinburgh to one of the great heroes of the Second World War, Woytek the bear. A campaign is afoot (yes, OK, but I shall refrain from the obvious pun) to erect a statue to the ursine war hero near Edinburgh, his adopted city. In 1942 Polish soldiers who had not so long ago been released from Siberia and whose general had insisted that they fight on the western front (their officers had been killed in Katyn and other camps) were in Iran where they acquired a honey-coloured bear cub. They fed him milk out of an old vodka bottle, reared him and treated him not as pet, but as a fellow soldier as they made their way across the Middle East to the Lebanese front. He was said to help soldiers in their heroic fight at Monte Cassino by carrying supplies of various kinds. Wojtek became the symbol of the 22nd Transport Company. With them he sailed to Scotland where he is supposed to have marched off the ship on his hind legs, just like a soldier. Eventually, the 22nd Company was disbanded; some of the soldiers went back to Poland but most stayed in Britain, guessing the fate that awaited them in their home country. Wojtek spent the rest of his 22 years in Edinburgh zoo, a media celebrity, whose greatest joy was visits from his erstwhile comrades who chatted to him in Polish and smuggled in beer and cigarettes. Wojtek has been mentioned in many accounts and a new book of his life is to be published shortly. Naturally enough, there is jubilation in Poland. Edinburgh will be the home to two new statues: Wojtek the bear and the privately funded statue of Adam Smith by Alexander Stoddart.